Surgery update for anyone who cares followed by an important reminder for YOU. I’m snuggled up in my home office with my dog and my computer. The boys are in the next room playing video games. I should cut off their screen time, but they’re in a continual state of giggles, so I think I’ll just let it be. Besides, that would require me standing and I don’t feel like doing that right now. I’m still sore from Wednesday’s surgery, although this time around has been way easier than the mastectomy or the first reconstruction. I attempted to drive to the grocery store yesterday. It wasn’t my best yes, but we now have milk, eggs and Froot Loops, so I’m calling it a win. I woke up this morning to the sound of Dakota barking her tail off. She’s pretty sure the UPS man is up to no good. My post-op brain is a little slow right now. I went through a quick mental checklist of what I may have ordered from Amazon while on pain medication. Not able to come up with anything, I decided to just open the package. 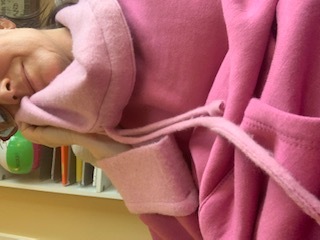 I stripped down in the middle of the kitchen and gingerly put on the WSPs (World’s Softest Pajamas) without making any of my incisions angry. Mission accomplished. Then I remembered that I didn’t actually order these. Again, my brain isn’t firing at full capacity so it took me a minute. Are they from my husband? No. My Kindness Team? No. All of a sudden I had it: Andrea. My bestie from Fargo and I have a difference of opinion when it comes to the words “I love you.” She never uses those words and I use them all the time. When we hang up the phone, I’ll say, “I love you!” and she’ll say, “Ditto!” It’s just her thing. I’m never insulted or discouraged because I know she does love me. She knew I would see that note and know it was her way of letting me know she’s thinking about me and caring for me. That note got me thinking about something that I think you might need to hear today. But just like Andrea has taught me through our years of friendship, love isn’t a series of words. It’s a series of actions. Sometimes we’re down and we need to hunt for his love. Other times, life feels so good we can’t deny His presence. Regardless of how we feel, His love is there. It’s all around us. He showers us with people who make us smile, songs that move our bodies and a daily art show outside our window that has no equal. Friend, don’t wait for the words. Train your eyes to see all He is giving you each day. And if you happen to come across a note that says, “Guess who?” there won’t be any doubt in your mind who loves you.